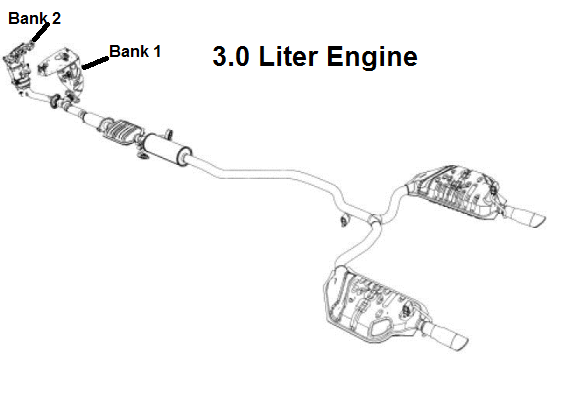 As the code description implies the P0430 code means that the vehicle's control module has detected that the three-way catalytic converter is not working properly (is not as efficient as the factory is expecting). Replacing the oxygen (O2) sensors may sometimes fix the code, but in most cases the catalytic convert needs to be replaced to fix the problem. If the P0430 code is combined with other codes, try fixing the other codes first. - Three way catalytic converter Bank 1 does not operate properly. - Three way catalyst converter Bank 1 does not have enough oxygen storage capacity. The Engine Control Module (ECM) monitors the switching frequency ratio of heated oxygen sensors 1 (front O2 sensor) and heated oxygen sensors 2 (rear O2 sensor). A three way catalyst converter (Manifold) with high oxygen storage capacity will indicate a low switching frequency of heated oxygen sensor 2. As oxygen storage capacity decreases, the heated oxygen sensor 2 switching frequency will increase. When the frequency ratio of heated oxygen sensors 1 and 2 approaches a specified limit value, the three way catalyst malfunction is diagnosed.